We weren’t locked in, but 22 of us looked slightly lost in the imposing Guard Room at Lambeth Palace this morning. The need to find space for break-out groups meant many of us had to make a morning trek to the forbidden lands ‘South of the River’ (i.e. to Lambeth rather than Westminster). It was the start of a morning with no debates and no Standing Orders! felt the last bit (including the strange recommendation that we spend 5 years putting together a new Church of England Catechism) was not very good. were uncomfortable about ‘disciple’ being used in the public sphere – it’s not a user-friendly word to fringers and outsiders. As the meerkats say – simples! We took coffee in the State Drawing Room, and then I went into a so-called ACT group (Accountability, Consultation, Transparency) on Simplification. Here about a hundred of us gathered to consider in an informal way the proposals set out in GS1980. Three other groups elsewhere looked at the other Reports. We can all think of ways we would like to simplify church life, but the Bishop of Willesden, who chaired the task group, explained just how complicated it can be. Specific ideas (e.g. abolishing banns and only offering church weddings after a civil ceremony) may look attractive to some, but would require changes in the law as well as pastoral practice. Nothing is simple. Stephen Slack, the legal adviser, surprised us by pointing out that much Church legislation predates the 1920s and thus comes under Acts of Parliament, rather than Measures. things that are putting unreasonable loads on parishes, Bishops and diocesan officers. Some of these could be a relatively quick fix, such as the inability to establish short-term clergy posts under the Common Tenure legislation. Despite being an urban Bishop par excellence, the Bishop of Willesden stated several times that the simplification group needs to listen to rural dioceses. They have the most pressing problems on church buildings, finding churchwardens, and pastoral reorganisation. Some ‘rural’ issues, such as having to deal with glebe in a bureaucratic way, are nuanced. Simplification (for example, not consulting the incumbent of a parish that formerly had its own glebe) would undoubtedly upset some people – but he said we have to make a judgement call as to whether that is sufficient to stop us changing. There is much more in the Simplification agenda, but we had not enough time. That raised the concern that in a short debate in the afternoon, we might fail to explore much of it – such as the controversial option of changing the compensation for loss of office procedures. The ACT group concept did bring out all sorts of issues and dealt with them in a way that avoided lots of scattergun speeches in the formal debate. Tweets indicated there was some dissatisfaction in the group dealing with the Green report and allied topics. However, in Simplification we had a panel of 8 experts, who mostly listened, and occasionally clarified. The advantage of the ACT process is that people can listen, probe and learn without the constraints of procedure. The result is we had attenuated debate and (some would say) less than full scrutiny of some very significant proposals. Calling the groups ‘ACT’ groups felt like a brave attempt to brand them as something new and significant, and that smelled of the management-speak everyone is so annoyed about. But after lunch, no more cosy chatty group work. It was ‘make up your mind’ time. Support the poor: resource the training. These two subjects got conflated into one debate in the afternoon. Not helpful. When it came to handling the very controversial ministerial education materials (handled by the Bishop of Sheffield) , several amendments were brought in attempts to slow things down to allow better consultation with the current training colleges and courses. There is a fear that more residential course closures are round the corner (my own alma mater St John’s Nottingham is to cease residential training). Some people think that the increase in ordinand numbers and the stress on local funding and part-time training will lower the quality of clergy, too. Fr Thomas Seville wanted serious research and then amendment of the plans. He withdrew his amendment, but was very dissatisfied with the way the agenda had been handled. In the event, the Bishop and John Spence undertook to bring the work back before implementation. After some fun with points of order, and increasing tension (and heat), the motion was passed. But I sensed some disgruntlement around the floor. (Keep it simple, stupid). Having been to this morning’s ACT group (see above), the Simplification debate seemed less exciting to me than to those who were at other ACT groups. One or two members chose to make again the speech they made at the morning ACT group, (which rather defeated the object of the exercise). Others raised particular objections (such as the proposed new severance packages for clergy who might be removed from office under certain circumstances, and were told that they could debate the detail when specific proposals come forward. Generally, there was wide acceptance, so it goes on for more detailed work and will return – probably several times as the various strands get unravelled. Andreas Whittam Smith gave an excellent analysis of the issues around the proposals to free up some large amounts of Church Commissioners funding to meet the present crisis (several people agree we have one, and need to do something about it now). So by the end of the day, all the Task Group reports had been accepted, though not without some degree of climb-downs and commitments to bring details back to Synod in the most controversial areas. Disclaimer: this does not apply to the Green report, which was not debated and not accepted because it was never brought to Synod anyway. Today was like no other London Synod day that I can recall in my 9 years on Synod. But we are set on the ‘reform and renewal’ path. The Archbishops’ Council and the Business Committee will have to make up their minds now about how to process the next stages of this complex programme. Hopefully they will bear in mind the lost goodwill caused by poor process, and July will be a happier time than this has been. Protestors banner hanging down. There’ll be some security checks now! We had a demo tonight. 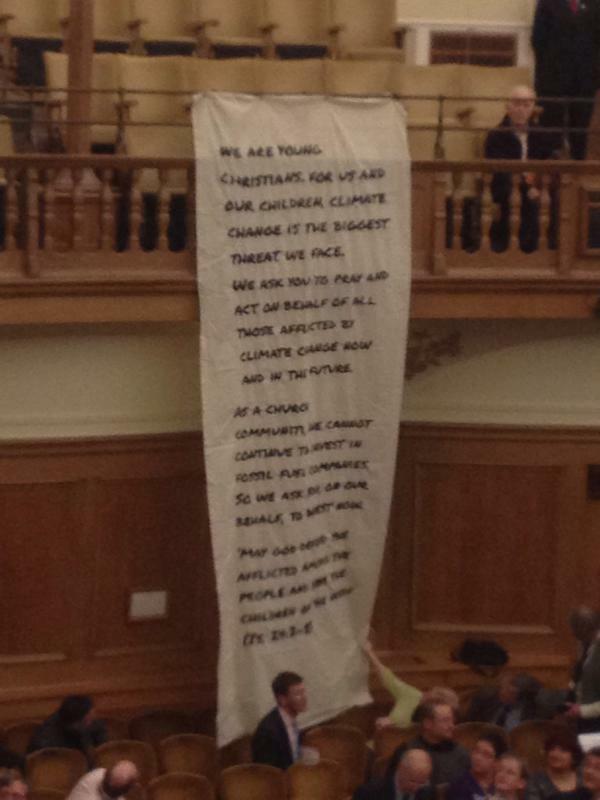 People protesting about fossil fuels got into the gallery and unwrapped a huge banner, singing Amazing Grace just as Synod was getting ready for evening worship. As I left the Dean’s Yard entrance, the Abbey’s security people had closed the iron gates that lead onto the street and the protestors were camping out with candle lights in jam jars. 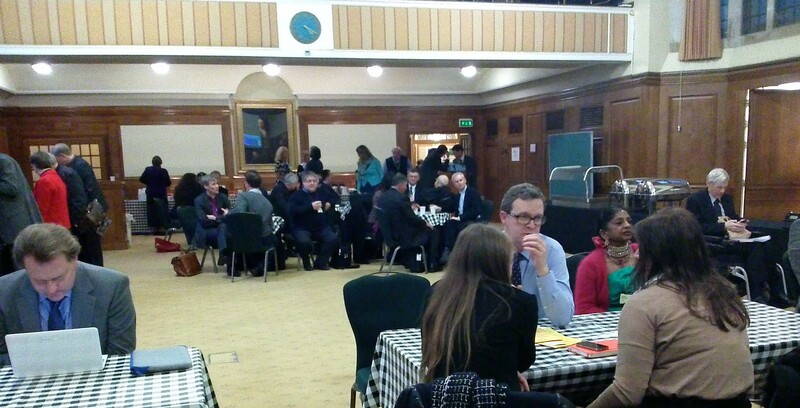 This entry was posted in 2015: February - London, General Synod and tagged Church of England, discipleship training, House of Bishops, Lambeth Palace, Simplification, Task Group. Bookmark the permalink.